My name is Clive Finkelstein. I originally established this website in 1995 for use by my company: Information Engineering Services Pty Ltd (IES). I set it up so that IES could communicate to the world its development of courses and its publication of books and papers on the latest IT Methodologies and Technologies, particularly in relation to Enterprise Architecture. As I have now retired, I have decided to close down IES. I do not want my work to cease when I have gone. I have therefore taken over this website to continue to make my life's work available for use by others: in many cases for free, or at very low cost as follows:. 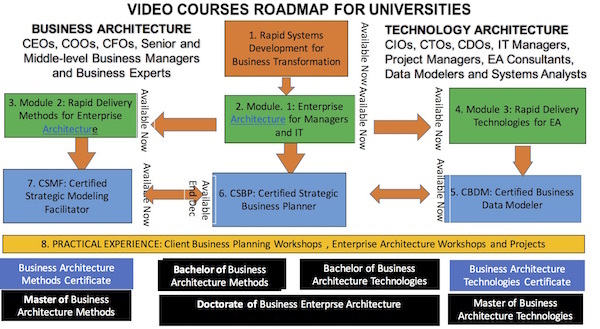 The left-hand side of the Course Roadmap in Figure 1 below shows the courses that are available for BUSINESS ARCHITECTURE. These are for an audience of Chief Executive Officers, Chief Operating Officers, Chief Financial Officers, Senior-level and Middle-level Business Managers and Business Experts. The right-hand side of the Course Roadmap shows the courses that are available for TECHNOLOGY ARCHITECTURE. These are for an audience of Chief Information Officers, Chief Technology Officers, Chief Data Officers, IT Managers, Project Managers, Data Modelers, EA Consultants, Systems Analysts and Developers. Reference Textbook: "Enterprise Architecture for Integration: Rapid Delivery Methods and Technologies"
You may know of me as the acknowledged "Father" of Information Engineering (IE), developed by Information Engineering Services Pty Ltd (IES) and myself in Australia from 1976 - 1980. IE was first fully published in the co-authored book: James Martin and Clive Finkelstein, "Information Engineering", Savant Institute, Carnforth, Lancs (1981). This was the book that started the IE Revolution in the 1980's. There were problems with some variants of Information Engineering in the 1980's, as discussed in my 2014 paper: What is Wrong with Information Engineering and How to Fix it? (in PDF). From 1995-2000, I developed an enhanced version of Information Engineering, called "Enterprise Engineering". I developed Enterprise Engineering specifically for the rapid delivery of Enterprise Architecture into production as databases and systems, in 3-month increments of increasing functionality . This is achieved by a revolutionary new method that derives project plans directly from data models. It also enables reusable processes to be easily identified from data models. This method is completely new to data modeling. To communicate Enterprise Engineering, I developed a new 5-day course: "Rapid Enterprise Architecture Delivery Workshop" that I presented throughout the world from 1995 - 2011. I fully documented this course in a new book, titled: Clive Finkelstein, "Enterprise Architecture for Integration: Rapid Delivery Methods and Technologies". The First Edition was published in Nov 2006 as a hardcover book by Artech House in Norwood, MA. The First Edition is still available for purchase from Artech House, or from Amazon for $US159 per copy. The Second Edition was published in June, 2011 as an eBook of 540 pages in PDF, originally for purchase from this website at $A30 per copy. The Second Edition is still available for purchase from the Apple iBooks Store at $US33.99 per copy for reading on the Apple iPad; or from Amazon at $US29.99 per copy for reading on the Kindle. The Third Edition was published in Feb, 2015 as an eBook of 574 pages in PDF for purchase from this website at $US30 per copy. The Third Edition will shortly be made available for purchase from the Apple iBooks Store for reading on the Apple iPad. Free Licensed Use of Course Materials for 5-day, skills-transfer, hands-on "Rapid Enterprise Architecture Delivery Workshop"
Now that I have retired, I am looking world-wide for large Consulting, Education , Modeling Tool and/or Software Development companies - or Universities - that focus on EA and that are interested in the free Licensed Use (with no upfront charge) of the Course Materials for the 5-Day "Rapid Enterprise Architecture Delivery Workshop". These course materials are in PowerPoint, with Course Handouts for Delegates and complete Instructor Notes in PDF. This course represents a full University year of training in rapid Enterprise Architecture delivery methods and technologies. Universities may choose to add this course to their IT curriculum - and also to their Business School curriculum - for training students each year. Large organizations that wish to use this course for internal training of their own staff may choose to add this course to their internal training curriculum. For Universities and large organizations, the PowerPoint files needed to present the course are offered for sale on an annual or monthly subscription fee basis. The course materials also include the Reference eBook: of 574 pages: Clive Finkelstein, "Enterprise Architecture for Integration: Rapid Delivery Methods and Technologies", Third Edition (2015). Delegates who attend a scheduled presentation of this Licensed workshop in a Public or In-house Course presented by a Licensed organization may receive one copy of the Reference eBook free for their personal use. The above Reference eBook is also available for separate personal purchase, as detailed below. detailed below, for use with the Reference eBook. These are designed to help you establish a profitable Business Plan of Public Courses, In-house Courses and EA Consulting projects in multiple regions of your assigned geographic area(s). You will be required to email to Clive Finkelstein the completed first year's Course Planner Excel spreadsheet for approval. Approved Licensees will be asked to sign the License Agreement, after which the PowerPoint files and the associated PDF files will be supplied to you for Licensed Use. A License Fee is payable quarterly, based on 10% of the total profits that your company generates from the Licensed Use of the Course Materials for the workshop. NOTE: Your company retains the other 90% of the total profits that are generated from the Licensed use of the Course Materials for the workshop. "Rapid Enterprise Architecture Delivery Workshop"
A comprehensive Overview (in PDF) of the structure of the course is also available for download from here. The Course Handouts for delegates of the "Rapid Enterprise Architecture Delivery Workshop" are now available for purchase at $US50 per copy. These show 3 slides per page, with room for hand-written notes adjacent to each slide. These handouts are intended for purchase and use by individuals who want to view the course handouts for the Rapid EA Delivery Workshop, in conjunction with reading the Reference eBook for the course. 2CheckOut.com Inc. (Ohio, USA) is an authorized retailer for goods and services provided by Clive Finkelstein. The complete Instructor Notes for the "Rapid Enterprise Architecture Delivery Workshop" are now available for purchase at $US500 per copy. These show 1 slide per page, with comprehensive instructor notes below each slide. These notes are intended for purchase and use by individuals who want to view the comprehensive instructor notes for the Rapid EA Delivery Workshop, in conjunction with reading the Reference eBook for the course. 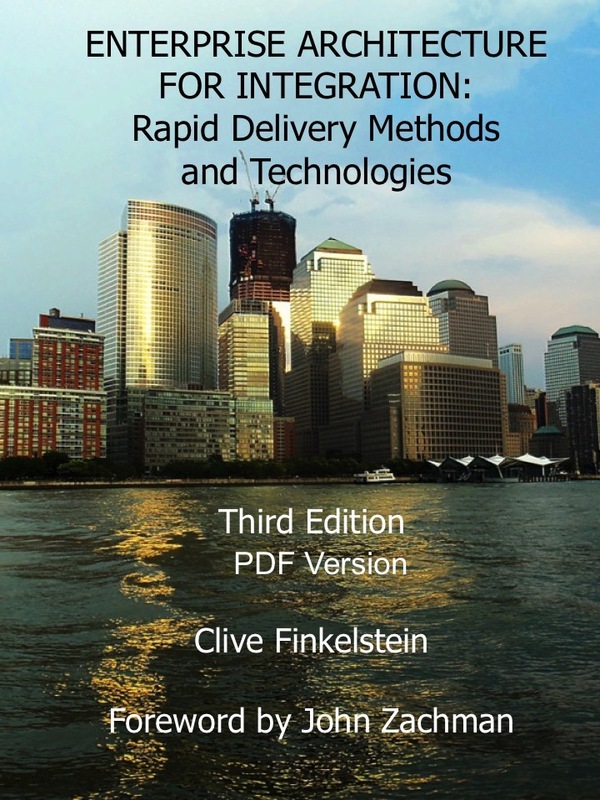 The Third Edition of "Enterprise Architecture for Integration: Rapid Delivery Methods and Technologies", Clive Finkelstein (2015) is now available as an eBook in PDF for purchase and download. This eBook comprises 574 Pages of printable PDF for the eBook, plus 263 pages of printable PDF as problems and sample solutions, as well as product descriptions for the latest rapid delivery technologies. The PDF is formatted to be printed single- or double-sided for hardcopy reference. It can also be fully navigated, with clickable Bookmarks and Table of Contents links. The Third Edition is now available for $USD30 in PDF using the Buy Now button below. The First Edition (2006) of this book is available in Hardcover for $US159 from www.amazon.com. The Second Edition (2011) is available from the Apple iBooks Store for the Apple iPad for $US33.99 or from Amazon for $US29.99 as a Kindle Edition. Search the Apple bookstore or www.amazon.com for the author: "Clive Finkelstein". The Third Edition (2015) is now also available from Amazon for $US9.99 as a Kindle Edition. Search www.amazon.com for the author: "Clive Finkelstein".